"Remember man, that you are dust; and unto dust you will return". Each year, on Ash Wednesday, we are signed with ashes on our foreheads. The priest, deacon or Eucharistic minister uses the admonition just mentioned - or one similar to it - to remind us of our earthly mortality. Death and the corruption of our physical bodies in the grave is one of the consequences of mankind's disobedience - that is, the 'original sin' of our first parent, Adam and Eve. All human persons since then are heirs to the punishment of that first disobedience. The so called "stain of original sin" accompanies our birth into this world. We are subject to temptation, just as Adam and Eve were, and we have propensity to reject God's way, preferring to put ourselves first. In all honesty each of us must admit that in one way or another we too have been disobedient children of our heavenly father. We live with the reality of mortality. One day, God knows when, you and I will die. Our bodies will be consigned to the earth where they will undergo corruption. The singularly Blessed Mother of Jesus Christ was preserved, by God's choice, from all stain of sin. She was conceived immaculate, form the moment of her conception in the womb of her mother, Anna. Her will was always aligned with the will of God, even with the magnitude of the angel's annunciation that she, a virgin, was to give to a son. When she understood that it was by the power of God's Holy Spirit that her womb would be fructified, she obediently said "yes". . . "be it done unto me according to your word". The early writings of the 'Fathers of the Church' have consistently remarked that since Christ is "The New Adam", the one who was always obedient to the father's will, so also Mary, by her obedient "Yes" was exalted to the position of being "The New Eve". Since death and corruption in the grave is one of the consequences of sin, it was only logical that theologians drew the conclusion that Mary, the "New Eve" should be exempt from the consequences of sin. Throughout her earthly life she saw herself as "The Handmaid of the Lord" and her earlier avowal, "Be it done unto me according to your word" was her guiding principle. 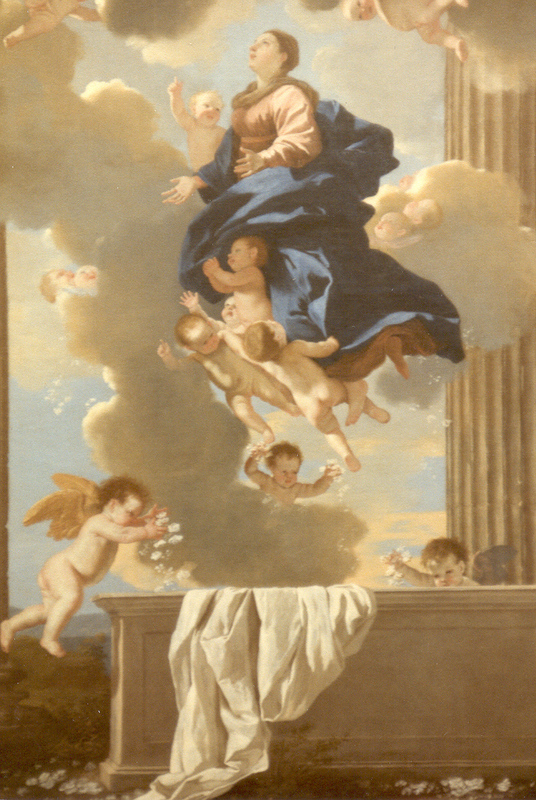 In response to the consistent belief of the Church, Pope Pius XII, in 1950, solemnly declared the Dogma of Mary's bodily assumption into heaven without undergoing the penalty of sin, corruption in the grave. The Catechism of the Catholic Church says: "The Assumption of the Blessed Virgin is a singular participation in her Son's resurrection and an anticipation of the resurrection of other Christians. We are God's children, created with a body and a soul. God loves each part of us - body and soul. With Mary as our precedent model we live with the hope of resurrection of our mortal bodies in a glorified form when her Son, Jesus comes to vindicate his victory over sin and death. So today we celebrate extreme munificence (benevolence) of God who gave us the mother of his Son to be our spiritual mother and advocate. With the universal church we celebrate her exalted position and pray: "Holy Mary, Mother of God, Queen assumed into heaven, pray for us sinners - now - and at the hour of our death".